World Golf: Product Review: Bazooka 320J Driver by Tour Edge - Golf Travel, Golf Vacation Packages, Golf News & Reviews, Golf Resorts. Hey, wait a minute! 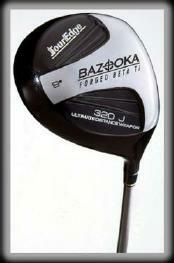 There is, in fact, just such a club: The Tour Edge Bazooka 320J. This driver-one of the lightest, longest, and highest-priced on the market - may stretch your budget, but it will also most certainly stretch your tee shots. The Bazooka has two design features that produce explosive distance worthy of its name: A super-thin beta-titanium clubface and a feather-light design. The latter allows you to create tremendous clubhead speed with an easy swing. 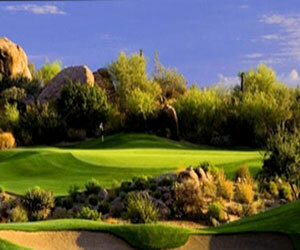 The former punishes that poor little golf ball something fierce. We passed a spanking new Bazooka 320J (46.5", R-flex graphite shaft) around the local driving range and took it along on a couple of outings, inviting low, mid, and high handicappers to take their cuts. The verdict: Guilty of adding distance to everyone's drives. The jury remained hung with respect to accuracy, however. The key with the Bazooka was to swing it easy. This is not always a simple task, given that it's incredibly light weight made it feel barely heavier than your standard fly swatter. One low-handicapper (an athletic, 6'4" college student with great clubhead speed) loved the way the ball felt off the Ti face of the Bazooka, but he couldn't get his timing right with the R-flex shaft. Both he and a high-handicapper with an equally fast swing and a much more dangerous tendency to slice, may have found the S-flex shaft more appropriate for their swings. The golfers who had slower swings loved the Bazooka. Both on the range and in real playing conditions, these guys consistently reported getting 20+ yards from the Bazooka, in comparison to their own drivers. And everyone we asked to test this club - whether this particular model fit them or not - was heard at some point to utter simply, "Wow." So what's the catch? Well, the Bazooka 320J is legal, but it has an illegal MSRP of $600. Still, if you've got the green, and you want to drive the greens on those 280-330 yard par 4s, this club deserves a very close look. The light weight and the long shaft (you may have to squint to see the ball so far away) may take some getting used to, but you have to expect a learning curve with a weapon this powerful.